Please complete the form below to tell a friend about job 3rd Shift Production Coordinator. Responsible for supervising 3rd Shift production employees from 8:30pm – 7:00am, Monday – Thursday. Ability to work in fast paced, innovative, manufacturing environment, while meeting goals, delivery, and budget requirements. Oversee daily production efficiency of 20-50 employees. Implement and enforce safety guidelines. Evaluate and monitor employee performance through performance plans and assessments, developing performance objectives, coaching and counseling our diverse workforce. Plan and schedule direct labor workforce. Responsible for checking employees’ time and attendance on a daily basis. Foster and develop a well trained workforce. Provide and document proper training. Troubleshoot and solve production issues. Ensure on time delivery of product while maintaining quality standards. Communicate with other supervisors to coordinate operations and activities within or between departments. Establish and maintain effective business relationships across multiple functions. Recommend methods to improve production. Ensure team conformance to company’s policies, standards, and procedures. Interpret specifications and work instructions for workers. 2. High school diploma or equivalent. 3. Excellent written and oral communication skills required. 4. Ability to lead, motivate, influence, and encourage a diverse workforce. 5. Good organizational skills with attention to details. 6. Experience in coaching, training, and hiring employees. 7. Ability to prioritize and follow through on multiple tasks/projects. 8. Strong computer and analytical skills. 10. Able to meet strict deadlines. 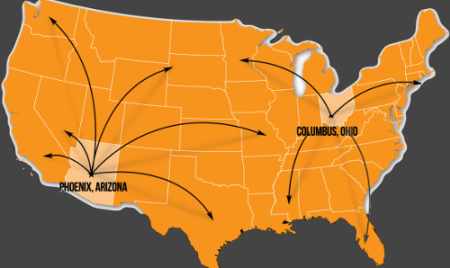 ITC maintains a manufacturing and distribution presence in Phoenix, AZ, as well as a manufacturing and distribution plant in Columbus, OH. With effective market coverage from coast to coast, we strive to continue being the industry leader in high quality and competitive wire and steel products. Thank you for your interest in ITC Manufacturing. Please contact us using the information below. To get the latest updates from ITC, subscribe to our newsletter or connect with us on social media.